One reason for the resilience of the rally is the continuous rotation that we’re seeing from sector to sector. The rotation of cash within the market indicates that traders remain nimble and aren’t becoming complacent. This speaks well for stocks as complacency is almost always a sign of a market top. Today’s three big stock charts look at the technical of Boeing Co (NYSE:BA), Electronic Arts Inc. (NASDAQ:EA) and FireEye Inc. (NASDAQ:FEYE), three stocks that provide a good representation of the migration that is keeping the market running higher. The Aerospace and Defense sector continues higher with Boeing leading the way. The renewed forward-looking vision of the company has investors and traders bidding shares higher, and rightly so. Add to that, improving delivery numbers and Boeing’s stock chart looks like it’s on a trajectory to the moon. Boeing continues to be fueled by positive fundamental and technical developments. The rally has led to an overbought signal from the stock’s RSI, but Boeing has shown in the past that their strong rallies are able to persist in these conditions. 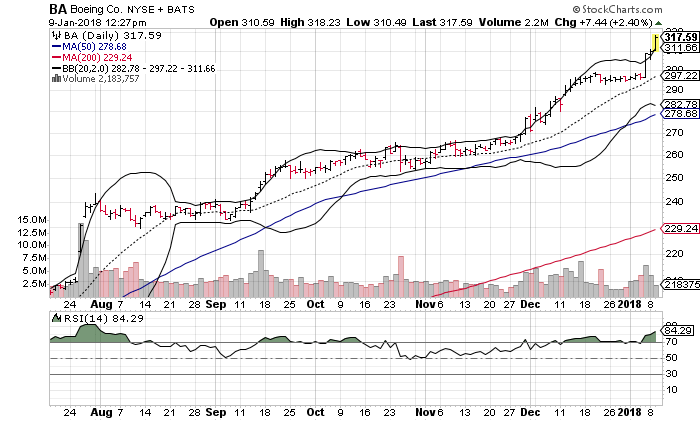 Today’s move in Boeing stock has broken its upper Bollinger Band. This means that the stock has initiated a volatility rally that will be driven higher as traders and long-term investors continue to crowd into this market-leading stock. The last similar rally saw a 5% run in shares over a little more than a week. Any pullback in Boeing shares should find support at $300 based solely on the round-numbered feature of the price. This could serve as a good buying target for those bulls that want to buy the stock a little cheaper. Electronic Arts shares are suffering from a holiday hangover as the slight rally that the stock saw ahead of the holidays is starting to recede. Traders should recognize that seasonality is providing a headwind for the video game maker, as well as a worsening technical trend. All signs point to a worsening January followed by a potential bounce in February. 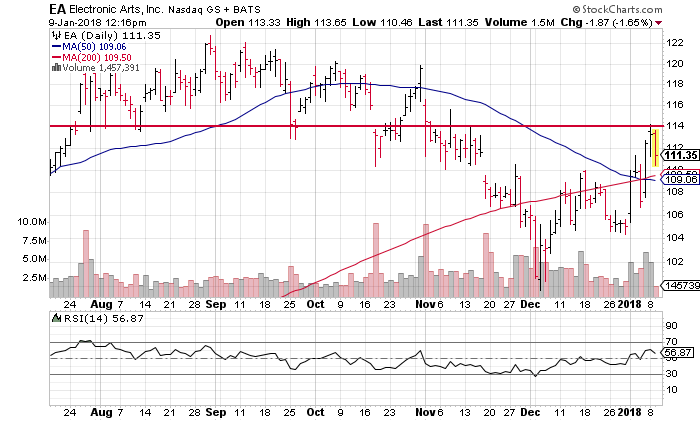 Shares of Electronic Arts are facing strong chart resistance at $114 as indicated by the red line in the chart above. This “line in the sand” will act as a buy/sell signal for the technical traders over the next week. Failure to break back above the $114 price will lead to increased selling. A “Death Cross” pattern formed for Electronic Arts shares last week when the 50-day moving average moved below the 200-day. This casts a bearish forecast on the stock for the next 3-6 months as it signals that the trend for the stock is worsening. In addition to chart resistance at $114, EA shares are facing a struggle overhead as the 10-month moving average sits at this same price. This makes the task of crossing back above the critical price point even tougher. Watch for a reversal to lead to a near-term test of $96.40, site of the stock’s 20-month moving average. Breaking its normally strong seasonality, Fireye stock is finding itself in a worsening condition as the trend is turning against the cloud security software company. A recent technical pattern is signaling that lower prices are on the horizon, and the last weeks’ worth of price change may be the beginning of that move. The 50- and 200-day moving averages of Fireye stock formed a “Death Cross” pattern in the end of December. Historically, this pattern precedes a move lower as the patter identifies a weakening of a stock’s trends. Last week, Fireye stock consolidated just above $15 as shares tried to rally along with the market. That buying volume has now tapered-off, resulting in a rejection of this price level. The red line in the chart above identifies this price, which has been strong chart support and resistance in the past six months. Today’s price activity has Fireye shares moving back below their 200-day moving average. A break of this trendline will increase the selling pressure that shares will see as the technical traders will start to be more concerned with the intermediate-term price movement. 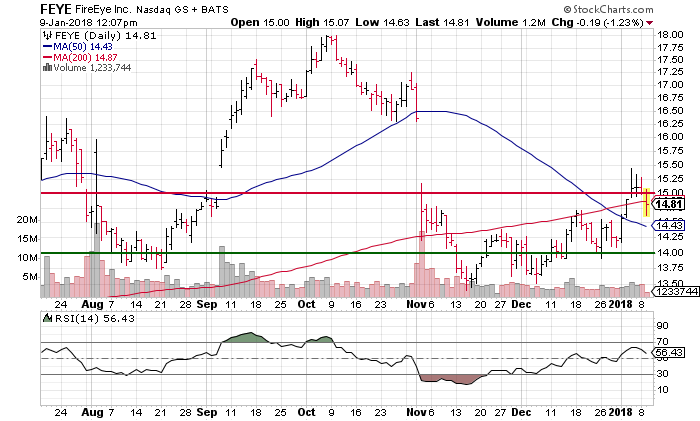 Watch for $14.30 to act as some support for Fireye, but a break lower will move the stock into bear market territory. Article printed from InvestorPlace Media, https://investorplace.com/2018/01/3-big-stock-charts-boeing-electronic-arts-and-fireeye/.